The all-new 2019 Ford Ranger storms back into the mid-size truck market after a nearly decade long hiatus. The market has seen the return of demand for tough and capable trucks that offer enough style and functionality for everyday commuting. Along with style and utility in spades, the all-new Ranger brings innovation in the form of an exciting new EcoBoost 4-cylinder engine that had the truck world buzzing before the Ranger even hit the showroom floor. The new Ranger is available in the standard and extended cab configurations as well as a crew cab option, which is a new to North America feature for the Ranger. The Ranger features a 6-foot bed, which is chopped down to a still respectable 5-foot bed on SuperCrew cab models. 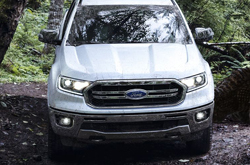 The 2019 Ford Ranger is available in 3 main trim levels; XL, XLT, and Lariat. There are several sub-trim equipment and appearance packages to suit many different tastes and uses. The FX4 package provides a sporty off-road appearance along with 4-wheel-drive and many of the more popular equipment and options. The 2019 Ranger is designed to be a truck for everyday. 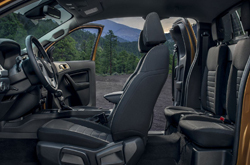 As such, Ford has incorporated several new features that make the Ranger compatible with day to day life. The new advanced Sync 3 system takes in-car connectivity to the next level. With available FordConnect 4G LTE WiFi, drivers and passengers can stay connected wherever the road may take them. Ford has also partnered with the latest mobile technology providers to introduce Ford+Waze social based navigation systems as well as Ford+Alexa integrated smart device compatibility. These features allow drivers to get real time feedback on traffic conditions, including lurking police speed traps, as well as smart home integration, such as turning on the lights and preheating the oven on the way home. Is the Ford Ranger an Efficient Performer? The all-new Ranger is offered with only one engine option, but that engine is everything a truck owner could want in a power plant. The 2.3L 4-Cylinder EcoBoost offers amazing economy while simultaneously providing big truck horsepower and torque. The 2019 Ranger produces an impressive 270 horsepower and a class-leading 310 lb-ft of torque. Most impressive is the EPA rating of 26 mpg combined, which makes it the most fuel efficient mid-size truck in America. Ford places an emphasis on collision prevention with the all new Ranger. 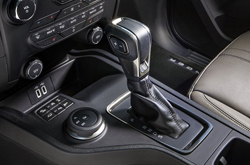 The 2019 Ranger features Ford Co-Pilot 360 package of safety inspired technology. A highlight of this system is the advanced BLIS blind-spot detection system. This goes beyond most by automatically measuring and including clearance for trailers and other towed cargo. This system works in conjunction with lane keeping technology to provide alerts and steering feedback when veering from the intended lane of travel. 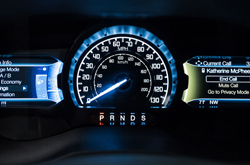 The 2019 Ranger also features adaptive cruise control with active braking and collision avoidance with emergency braking technology.